Thus, what the witness thinks "dominates" (controls) to some extent their observation. Witnesses identify behaviors and attitudes as completely normal in cases of extraterrestrial visitors. They behave as would any person, for example, who has suffered a setback on the road. Witnesses recognize the staging (theater) as the UFO landing due to some fault in the aircraft and their crews repairing it in the same way that a car is repaired. 2 The humanoids behave and use human-like tools and procedures in their repair work. On the night of November 23, 1964, in New Berlin (New York), 1:00 am, Ms. Marianne observed a light coming down. With the aid of binoculars she saw a very bright object supported by several feet. A light emerged below the artefact, illuminating the ground. She could not specify the shape of the UFO. Accompanied by her mother-in-law, the witness saw 5 or 6 humanoids working on repairing the object. They had a height of 2 meters and 2.5 meters. They wore costumes like a divers-suit, dark in color. On the ground was a large object like a motor or generator. The witness indicated that the humanoids were working with the same movements as would a terrestrial mechanic: kneeling, lying on the ground, leaning on elbows, et cetera. Then the, women observed another UFO landing nearby. From that object, 4 o 5 humanoids descended to help the others with repair tasks. They came and went constantly, between artifacts, carrying all kinds of tools. The humanoids cut a long wire into several equal sections. When they tried to enter the "engine" under the UFO they couldn’t for some reason. After trying on 4 occasions, after much effort, they succeeded getting to the engine. They gathered all their tools and the crews returned to their respective aircrafts. At 4.55 am, the first object disappeared in the distance. Just a minute later, the second UFO flew away. The next day Marianne, with Richard, her husband (who the night before was hunting with his father) inspected the landing spot. They found three irregularly shaped footprints of about 45'5 centimeters deep. Something heavy had caused the indentations. Marianne found a piece of cable about 2.5 centimeters in diameter, wrapped in a paper-like material. The cable was similar to aluminum, but did not have the specific qualities of that metal. Upon returning home, the mother of Richard kept the piece of cable, but when the researchers came to the site, it had inexplicably disappeared. No doubt in some cases associated with the phenomenon of distortion, the material created from such an encounter will last beyond the presence of the entities in the place of the apparition. It would be “ephemeral material” whose existence would not last for a long time, vanishing without a trace -- a phenomenon observed for example in the "showers of angel hair" in some UFO encounters, and even the apparition of the Virgin of Fatima, which appeared from the sky and then disappeared. 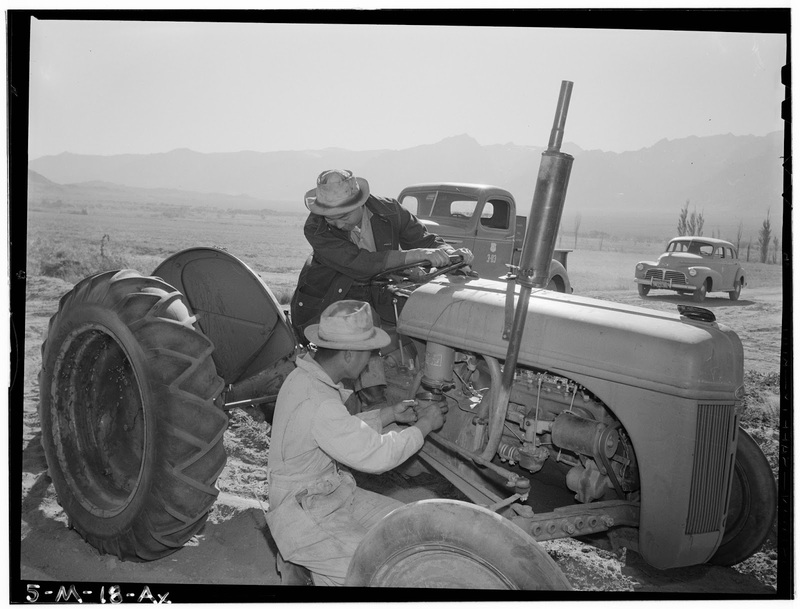 The identification of a universal “archetype” i.e., repair, and the witness's mental contribution by incorporating the tools and human procedures that she, Marianne, observed when young, on the farm of her father, who would sometimes help several people do repair work on machinery or engine generators. A feature also observed to be very "human" was to fail, repeatedly, when fitting the motor into the object by the humanoids. The whole scene of mechanical aliens, not just an archetypal representation is "something" else. It is something like a kind of "oneiric experience" with physical reality, produced (assembled) by the unconscious of the witness, with the help of unknown intelligences. The interaction of "them" in our psyche, makes the "movie" of Alien repair a product and result of the perfect symbiosis of identifiable archetypes (inherent to all human beings) and the obvious distortion of memory, imagination and knowledge of each person. The mechanism is very similar (although not equal to) what we experience while dreaming. If you reader find this strange, you should know that every night, while you sleep, your brain recreates all kinds of situations, distorting everyday life experiences; your ability to reason is partly annulled. The phenomenon of distortion is based on many of these oneiric precepts and unconscious processes of the human mind. If the theory of distortion was the result of a purely mental causes or caused by a physical effect (Persinger’s theory) without the participation of an external agent, the patterns of the apparitions would not contain common elements. The experience would be much more unique, extravagant and completely disorganized and incoherent. But mostly, those views, mental aberration and/or physical effects, expose a serious error that completely invalidates a global solution of the UFO phenomenon. They do not explain. Why not? For example, in some places, UFO landings occurred frequently at certain times and now the "process" is not repeated. But not only in specific locations. Entire nations have exapereinced a decrease of close encounters, and alleged "hallucinations" have not been replaced by another type of anomalous phenomena of perception. Both these hypotheses, mental quirks and Personger’s electromagnetic influence can not be put forward as solutions to the problem UFOs in a general context. 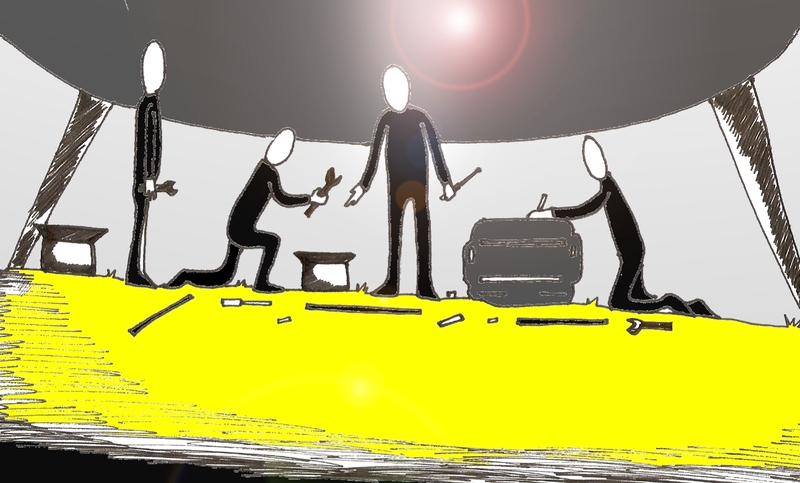 On numerous occasions, the crews of the UFOs seem to be engaged in the repair of their not so perfect flying saucers. On September 24, 1954, in Becar (France), two women, Mrs. Geoffrey and Miss Gisele Fin, reported seeing, in a field near their home, a dark gray disk. Along with the object, was a "man" apparently normal, with dark clothes and a sort of "cap" on his head. According to the witnesses, the humanoids were occupied in arduous tasks of repair. (See for comparison, the William Laxton incident, recounted earlier here). But it is not unique. On October 9, 1954, a draftsman named Willi Hoge, in Rinkerode (Germany), witnessed the landing along the road of a cigar-shaped object. From the UFO four beings descendedl rapidly. They were1.20 meters tall, big-headed, with short, thin legs, that, according to Hoge, were stuffed into "rubber" suits. The beings began, before the astonished gaze of the witness, to repair the object. In February 1977, in Montana, a Ms. Nielson and another woman observed, at dawn, an elongated object with a dome with a surrounding platform at the bottom. On April 20, 1950, a similar incident occurred in Italy. Bruno Facchini, went for a walk after a storm in the town of Abbiate Guazzone, when he observed a strong flare. Approaching the place, he saw a very large object, like a rugby ball, equipped with a ladder of about 7 or 8 meters high. From inside came a soft filtered, green light. Next to the object were several humanoids in diving suits with masks. One of the humanoids was standing on a pneumatic lift. He was "welding" the outside of the artefact. Facchini thought it was a military aircraft in trouble and approached. But after a short distance, one of the humanoids grunted and the witness, frightened, fled. One of the humanoids pointed an instrument, like a camera and Facchini felt a strong wind.Immediately the humanoids entered into the UFO, and flew off, with the sound of a strong buzz. April 12, 1897, at Girard, near Green Ridge (Illinois), a group of miners saw an unknown object land three miles north of Green Ridge and four miles south of Girard. The night machinist's for the Chicago and Alton Railroad, Paul McCrame, stated that he came so close to the artefact he saw a man repairing the machinery. Traces were found over a wide area. The object was elongated like a ship and had a roof and a double canopy. It left, flying north. A curious detail is that the witnesses observed, as the aircraft approached, an emblem on its side like the letter M.
April 14, 1897, Gas City (Ind.). An enormous object landed on the farm of John Rush after provoking a violent stampede of horses and cattle. Six occupants descended from the "object" and began to repair it, before it took off at high speed. (It had almost the identical number of “mechanics” of the Marianne incident ). On April 15, 1897, two laborers, Adolph Winkle and John Rubber, were luckier: they saw a strange object land in a field and conversed with its crew. The crew told them that the arteact had flown from Quincy to Springfield in thirty minutes and was on the ground to make electrical repairs. After the mass sightings of strange "airships" in the late 19th century and beginning of the 20th Century, we have to move to 1934 to find an unknown aerial phenomenon with similar characteristics. In Sweden, mainly, there were sightings of a mysterious "gray airplane" that never came to be identified. And again, we find similar situations: February 7, 1934. Oslo (Norway). From the coastal town of Tromsö came the following telegram: "An unknown plane has crashed or made an emergency landing Monday afternoon at Mount Fager, located in the region of Målselv. The inhabitants of the valley continued to look at the device when it fell on the mountain. The next morning the plane was still there and two men were visible by his side, apparently removing the snow. The police chief of Målselv County confirmed the veracity of the message. The accident, or the landing was seen from both sides of the mountain, according to [witness] statements. The witnesses were [credible] people." The next day, the Norwegian newspaper reported that a Tegna Tidens expedition managed to climb to the top of the mountain to search for remains. "Farmer Martensson of Fulgleli, said a patrol discovered two parallel grooves in the snow at about 350 meters northwest of the point where the plane had been seen. The tracks measured about 75 cm long and 80 cm wide...The patrol also found footprints around the tracks."